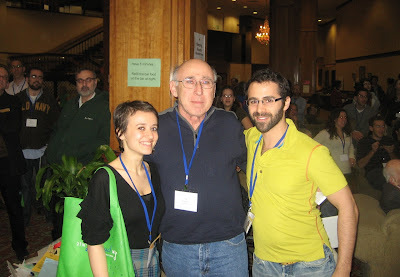 On the weekend of January 15-18, 2010, I attended the Limmud NY 2010 conference, where I had the honor of presenting my Jewish heroes video to an audience of 700, sung backup for my "20 Things To Do With Matzah" song onstage with Michelle Citrin, and presented a beginners' workshop in Flash animation. Read "700 Jews Can't Be Wrong", my blog post about the event for ROI, the organization that helped me travel to Limmud NY with a Speakers Bureau grant. You can see more photos from the event on my Facebook photo album.